Following Friday morning’s cold front, mostly cloudy skies were observed on Sunday with windy conditions and isolated snow flurries; weaker winds were observed on Sunday. Chilly temperatures will continue until Monday night, when two storm potentials are expected for the region. At least some snow is expected north and west of NYC on Monday night, with a more significant storm on Wednesday into Thursday that will produce heavy rain, wind, as well as snow and freezing rain for the interior. As previously mentioned, lighter winds are expected for Monday with less cloud cover, while temperatures end up slightly warmer, reaching the mid to upper 30s inland and the upper 30s to low 40s for the rest of the area. Temperatures will drop into the low to mid 20s inland and mid 20s to low 30s for the rest of the area. The first storm to bring the potential for snow into parts of the area since late November is expected on Monday night and Tuesday. A weak low pressure will move into the region, with light precipitation spreading into the region. The model guidance has gone back and forth on the track, ranging from the maximum precipitation ending up near the area or as far north as the Adirondacks, but one prevalent trend with today’s guidance has been to show a very marginal boundary layer along with onshore winds, which will likely keep the coast as well as NYC with rain despite 850mb temperatures below freezing. Precipitation is expected to develop towards 6-8 PM on Monday, mainly in the form of light snow north and west of NYC and rain for NYC and the coast. Temperatures will slightly warm up through the duration of the event, with the rain/snow line gradually spreading from the north/west suburbs around 9-11 PM to the northwestern areas by 4 AM. Precipitation will end by early Tuesday morning. At this time, up to 1 inch is expected for the north/west suburbs and 1-2 inches further inland. 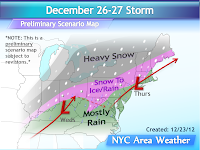 Mostly rain is expected for NYC and coastal areas. Brief updates will be posted on this event tomorrow night. The next storm to affect the region will follow shortly behind the first one, and will be stronger, larger and with more widespread reaching impacts. A strong storm will track towards the Ohio Valley but with a transfer to a secondary low pressure expected near Virginia, which then tracks towards NYC, Boston and then offshore. The model guidance today has slowly narrowed its range of solutions and is coming slowly closer towards the aforementioned track. The ECM ensemble mean is my model choice for the track, having been very consistent for the last five days with almost the same track while the rest of the models ranged from a western Pennsylvania track to a coastal low with an I-95 corridor snowstorm. To the left, I posted my preliminary scenario map, subject to some revisions. Precipitation is expected to develop for the area around the mid to late afternoon hours on Wednesday, starting out as snow north and west of NYC and rain from NYC and further south and east. The snow is expected to be brief in the NW suburbs, changing over to rain but with the possibility of minor accumulations possible further northwest. The heaviest precipitation is expected overnight; this will be in the form of heavy rain in the immediate NYC area, Long Island and southern CT, with at least 1 inch of rain possible. For interior parts of the area, snow is expected to transition to a mix of sleet and freezing rain, perhaps including rain as well, with the storm ending by Thursday morning. For the latest localized forecast, check the 5-Day Forecast page. The main hazards with this storm will be heavy rain and strong wind gusts for most of the area, with snow and freezing rain hazards for interior parts of the area, especially in NW NJ and SE NY. A moderately strong low level jet is expected with 925mb winds up to 60-70 knots, with the potential for gusts above 40 mph across the area on Wednesday night, especially for eastern parts of the area. Further inland, several inches of snow are possible, with freezing rain possible as well along with minor ice accumulations. Stay tuned for more information on this storm over the next few days. The active pattern continues into next weekend, when the next storm potential is expected for the region. This time period has a colder look to it than the mid week storm, with the ECM and GFS models showing a significant snowstorm for parts of the area. The UKMET model looks to show a coastal low pressure as well at the end of its run. This is still almost a week out, so additional changes are expected with the model guidance. At this time, a track too far west as in over the Great Lakes does not appear too likely, with the potential for this to be a snow producer in the region, potentially including the area, although it is still too early to narrow down specifics of this storm including the exact timing, location, intensity and precipitation types. With the storm likely around the weekend, however, this appears to potentially lead to a dry New Year’s Eve. Stay tuned for more information on this storm potential.